Dubai: Developers here are mixing it up — no longer is there a rigid fixation with towers or the sprawling villas. A recently formed development company, KOA, has launched a limited set of apartments — 70 in all — in a low-rise building format but set among 200,000 square feet of garden/landscaping. The “Canvas” is located near the Mohammad Bin Rashid Gardens, a location which has been seeing quite a bit of investor activity according to data from Dubai Land Department. Prices for the units — ranging from 580- to 5,000-square feet — are set between Dh1,000-Dh1,200 a square foot. And 41 of these apartments come with in varying floor plans. The land was acquired last year. “KOA’s focus will only be on smaller communities — anything on a bigger scale I’m not interested,” said Mohammad Zaal, CEO. “If the threshold of available units had been raised to 100, that would have made it too commercial. Lots of developers are already doing that. We will stick with a low FAR (floor area ratio) — again it helps with managing the construction and logistics costs. In fact, KAO’s stated intent with its projects — a second one is to be announced later in the year — is to target the millennial residents here, those who are likely to get into the property market for the first time. And for whom the accompanying lifestyle the environs can offer. “Again, there aren’t developers going for this demographic — their focus is exclusively on the baby-boomers,” said Zaal, who has also been associated with the upscale Al Barari villa community. “But the millennial buyer is striking roots in this city — this is where they grew up and want to be. For the Canvas’ sales programme, 44 units out of the 70 go on sale on day one and the rest a month thereafter. It will be strictly on a first-come, first-served basis despite the limited number of units. The first deliveries are due in Q1-18 and the entire lot by Q4-18. (On site, the initial construction works are already at an advanced stage, Zaal said.) On the leisure side, future occupants can take in three pools, paddle courts, a gourmet market and a garden populated with indigenous flora. Meanwhile, developers in Dubai bagged approvals for Dh100 billion worth of projects in 2016, Land Department data show. Some of these could head for the start line this year, ensuring development activity ticks along nicely. 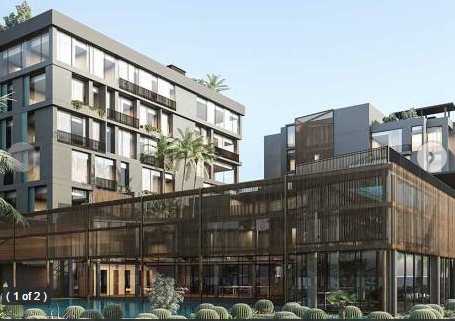 The first launches have already taken place, including Sobha Group’s Dh5 million plus “Quad Homes” at MBR (Mohammad Bin Rashid) City and Dubai Properties at its Villanova community in Dubailand. Even the big-ticket freehold property purchases are happening — one in the Burj Khalifa fetched Dh18 million plus, while a Palm unit recorded more than Dh10 million. January’s not proving chilly for Dubai’s developers and investors. All rights reserved to the initial publisher for lighter side of gulfnews.